It doesn’t take much to get me motivated about music, but when the people who are making it and involved with it are equally and effortlessly excited it makes my job a lot easier. Needless to say, when I watched Gypsy Grin perform at Houlihan’s at the Robinson Town Center in Pittsburgh on Wednesday June 30th for VH1’s Save The Music Foundation, I wouldn’t refer to it as work. Erik Jones, the band’s booker, continuously called upon me to attend one of their shows, repeatedly reminding me of the reasons I should see them for myself. Sitting outside on a cool yet cozy and comfortable patio under a yellow umbrella, I concluded that Gypsy Grin-—Mike Morelli on vocals/guitar, Matt Willer on vocals/guitar, Ed “Rivers” Draquilla on synth/keyboards, Pat Farone on bass guitar and Boris on drums, was much more than just evening entertainment. The band was set up in front of the restaurant entrance, and the first thing I noticed was the singer wasn’t the center of attention. I would like to preamble this part by saying that the band didn’t do their own set-up or sound, but nonetheless I was surprised to see that the bass player was the one getting the center stage spotlight. “We wanted to let everyone know that bass players are people too,” Pat jokes to me after their set. They played some complimentary covers, including “Sister Golden Hair” by America, “Come Together” by The Beatles and ended their set with “Roadhouse Blues” by The Doors. Now I have an array of two reactions when bands cover classic songs that have my heart in ways that are unheard of: excitement because they are playing them, usually preluded by plenty of alcohol and me loudly singing along, or apprehension because nobody could possibly play it with the potential it deserves, but Gypsy Grin was precise in their portrayals and had me soberly singing along! Although I was happy to hear the covers, I was much more impressed by their retro yet refreshing riffs. They played many songs from their cd, which is self-titled and out now, my favorite being “Time is Flowing On,” and by favorite I don’t just mean from their playlist, but my current favorite song of anything I’ve heard recently on the radio or making my rounds. Not only do they have all the instruments usually included in a band, but they also have a keyboard player who took the time to play trumpet on the song, and I realized they were a band that brought something new to the been-there-heard-that table. They bring beats you can bang your head to and the musical breaks during songs that are anything but boring. 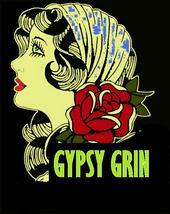 Gypsy Grin is a band with style – their songs don’t all sound the same. Each song starts with a different sound. Not only was the bass player in the middle, but two different singers sang during their set, adding yet another level of sound and energy to their stimulating set, proving that they were entertaining without being egotistical. Sara Fincham: How did you get involved with Save the Music? Mike Morelli: – Craigslist, actually. Found it on Craigslist. SF: Your MySpace page is very discreet! You were born in 2009—how did you all come together, paint me a picture of the elusive beginning? MM: Matt Willer and I met sometime in high school. We met and later discovered we had a few things in common: number 1 – we both loved The Beatles, number 2—we found that we both played guitar and composed original music. Matt and I played as a duo for a few years until Matt moved back to his home town of Ashland, KY. We would stay in touch as much as possible. keyboard player we decided we had found our final lineup. SF: You haven’t been around long, yet you’re playing shows and getting booked. I imagine you have a good work ethic? Has it been hard to get shows or is it coming easier than expected? MM: We rehearse at least once a week for hours on end. As for getting shows it has been easier than we thought. We just sent CDs to local bars and we were booked. The Regatta shows we owe a lot of thanks to our Management team of Chris and Megan Cantwell of Cashel Group. They were on the phone and emailing back and forth until we got what we wanted. SF: Right now are you just playing locally or do you take the show on the road? MM: For now just the Beaver County and Pittsburgh Areas. Labor Day weekend we are looking to book in Washington DC. SF: With the use of technology the sound of music has changed a lot and it’s nice to hear a band that sounds like the music from the past that made me love music in the first place. Is it important for you to be musically authentic and to pay tribute to the ones who paved the way before you? MM: We strive to emulate the sounds of the 1960’s and 70’s. The only reason I started playing music was because I heard a little band called The Beatles. I think it is very important to pay tribute to all of them. Without them music would not have evolved the way it has over the years. Today everyone has so many more options. SF: Going along with that question, in “Time is Flowing On” one of the lyrics is “Time is flowing on and I don’t seem to mind/There’s music in the air like it’s from another time.” Could you elaborate on that lyric? SF: How does songwriting work – is it a collaborative effort, or do you write songs individually? MM: So far this round of songs we recorded in the studio have been written by myself and Matt Willer. The next wave we would like to try to make it a more collaborative effort. Previous The drive By Truckers: Honk if You Hear Me!